PENSACOLA, FLA - Homeowners seeking privacy in a room without replacing their existing windows can turn to acrylic block interior shutters from Hy-Lite. "Imagine you have new neighbors and they've decided to locate their outdoor fire pit and conversation area in their yard right across from your master bathroom," says Roger Murphy, president of Hy-Lite, a U.S. Block Windows Company. "Instead of putting a heavy, dreary window treatment up to protect your privacy it's easy to add in acrylic block interior shutters." 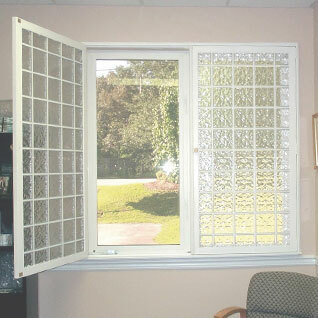 The operable interior shutters offered by Hy-Lite install over existing windows. The units can be left closed, or opened to allow in more light and ventilation through the original window. The shutters operate on hinges that allow them to be opened into the room, or closed to secure privacy. The interior shutters can also be used to upgrade the look of a room that needs a touch of style. "These stylish shutters are an excellent alternative to traditional window treatments," says Murphy. "The interior shutters come in a variety of custom sizes and feature either our Clear Wave or Glacier Wave acrylic blocks. The mulled units have durable cellular PVC white frames. Whether open or closed, these interior shutters can dramatically enhance the look of a room in just minutes .... and allow you privacy while your neighbors enjoy their backyard." Hy-Lite, a U.S. Block Windows Company, is the leading manufacturer of acrylic block, glass block and decorative glass windows. The company's privacy product options include acrylic block shutters, accent panels, radius walls, partition walls, door inserts and shower kits. Since 1988, the Pensacola, Florida-based company has been committed to providing residential and commercial construction professionals and homeowners with elegant, affordable privacy window designs. For more information, visit www.hy-lite.com.